"They just kept pounding and pounding and pounding and after about 40 minutes, it just broke a whole section apart,"
That takes away three pokestops and one gym. I wonder - gyms, stops and spawns cant be put in the water, non? What happens when OSM puts water on coordinates with any of that? 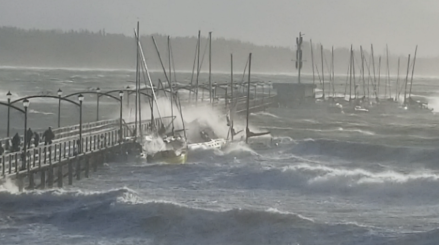 The pier got a good pounding. Rip in peace to the gym. And it is very close to the border, cant take a screenshot cuz my phone is suddenly autistic.